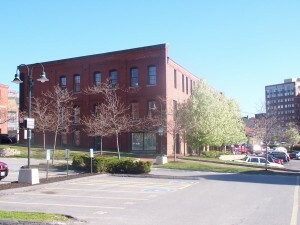 The Cannery building, located at the historic Gorhams Corner section of Portland. It is adjacent to One and Two Portland Square, Portland’s premier office complex. Traditional brick exterior, masonry-framed industrial style building completely rehabilitated in to multi-tenanted office building in 1996. Modern HVAC, elevator, internally wired for cable. Third floor suite offers views of the Portland waterfront and the Fore River. Ample windows, brick exterior walls, and modern interiors designed by the architectural firm, the Portland Design Team. Existing tenants include a law firm, computer services consultant, advertising, a weekly publication office, public relations firm, and a global designer of psychological testing forms. The historic Gorham's Corner section of Portland is on the fringe of the Old Port, the waterfront, and Portland's Central Business and Financial Districts. It is adjacent to One and Two Portland Square, Portland's premier office complex.